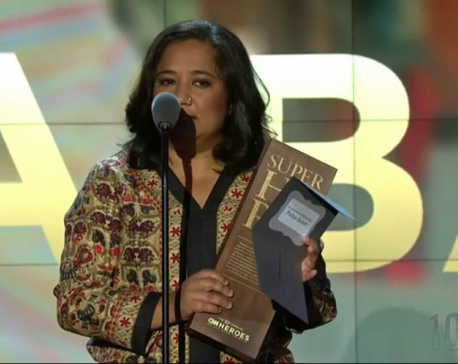 In this video grab Pushpa Basnet (center), founder of the Early Childhood Development Center, receiving the CNN Superhero award at the Shrine Auditorium in Los Angeles, California, USA, on Monday. 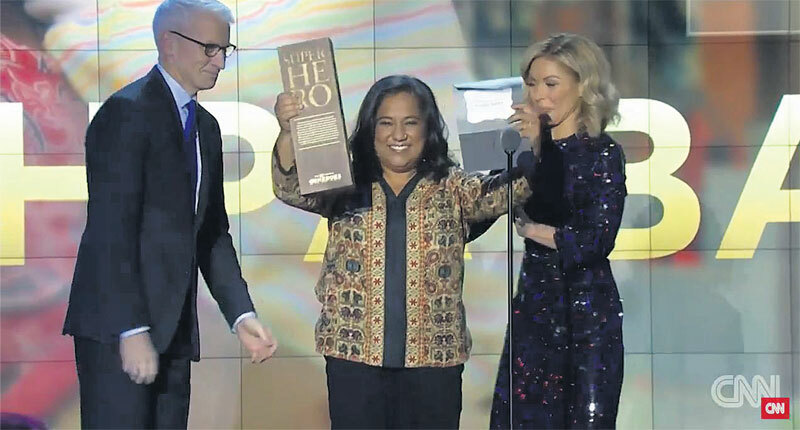 KATHMANDU, Dec 13: Nepali social worker Pushpa Basnet has been named as the CNN Superhero on Monday. She overcame four other former CNN Heroes to win the special award amidst a ceremony organized on the occasion of the 10th anniversary of the CNN Heroes campaign at the Shrine Auditorium in Los Angeles, California. Basnet was honored as CNN Hero in 2012 for her contributions to the welfare of children forced to stay with their parents inside prison. As part of the initiative she has been providing healthy meals, education, and medical services among other basic necessities to the children through her Early Childhood Development Center (ECDC). Founded in 2005, ECDC coordinates with prison authorities across the nation for rescuing children that are living with their parents inside prison. The rescued children are provided regular medical check-ups, vaccinations, and are enrolled in a local private school. According to ECDC, children regularly visit their parents. In an interview after winning the CNN Hero of the Year 2012, Basnet had told Republica that she became involved in the field after witnessing plight of such children during her academic field visits to prisons. As part of the BSW course at the St. Xavier College, Basnet visited women cell in Kalimati Police Station, where she came in touch with Inspector Mira Chaudhari. During this period, she got a chance to visit the only women’s prison in the country -Janana Women’s Penitentiary- at the Central Jail in Tripureshwor. What moved most the then 20-year old Basnet was the pitiable condition of tender aged children living with their inmate mothers. She met a one-year-old child living with his inmate mother, who was recently transferred there from Sindhupalchowk. It was then that she resolved to do something for such children. She discussed her desire to help such children with her parents - Purna Bahadur and Sarita. She was more than happy to find her parents supported her though they cautioned her of difficulties in the long run. The difficulty in materializing the idea began to surface as soon as she approached the prison authorities. “How can we believe a girl who is barely 20 years old can take care of inmates’ children?” a jail administrator had asked her in the starting days of her meetings with prison authorities. Similar doubts were expressed by the inmate mothers, when she approached them with a helping hand. On the basis of suggestions provided to her by some prison administrators, she started to work on establishing a NGO. On Monday Basnet’s thrill was evident when she received the honor. She extended her thanks to everyone for turning her dream into a reality on the occasion. “Thank you for making my dream a reality. The most important thing is that you need to believe in yourself, have passion,” she said. Edward Norton, Octavia Spencer, Keegan-Michael Key, among others gave presentations in the star-studded ceremony. Renowned singer Idina Menzel performed the song “I See You” from her album “Idina”. CNN, on its website, said that the 10th anniversary CNN Superhero is for a former CNN Hero of the Year whose outstanding work continues to best embody the spirit of the CNN Heroes campaign. Along with the honor, Basnet also received $50,000 , which the host said would help her “to continue her inspiring work”. Her four competitors for the awards were Robin Lim, Liz McCartney, Efren Peñaflorida and Chad Pregracke. Lim has been working with Bumi Sehat, a non-profit organization which she founded back in 1995 to help patients with a range of medical services in Indonesia and the Philippines. It especially focuses on the health of mothers and their babies. For her over two decades of contributions, she was named the 2011 CNN Hero of the Year. Another contestant for the award, McCartney played a commendable role in helping victims of Hurricane Katrina to rebuild their homes. The hurricane that took place in 2005 left much of New Orleans under water. She and her team have rebuilt nearly 1,200 homes across the USA, according to CNN. 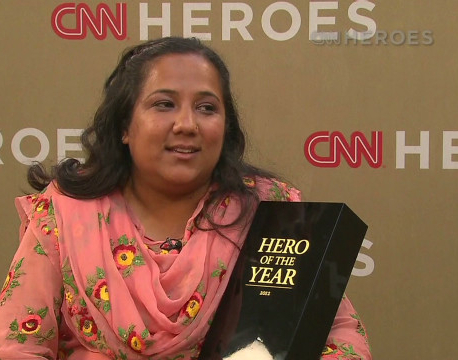 As an acknowledgement of her contributions, she was the named the first CNN Hero of the Year. Peñaflorida of Philippines has played commendable role in bringing education to an estimated 40,000 children around the world, according to CNN. He has played significant role in offering alternative to street gangs through education. He was named CNN Hero of the Year in 2009. Another constant for the award, Pregracke has dedicated his life to cleaning up waterways across America. The 2013 CNN Hero of the Year has removed millions of pounds of waste, trash and toxic chemicals from rivers across the United States, according to CNN.